The Kutb or Kootub Minar, distant about 12 miles from Dehlie S.W., is said to have been completed in the reign of Shumsodeen Altumsh (AD 1211) one of the Toorki Slave Kings. In Elphinstone’s India the height is stated at 242 feet, by the late Major General Mackenzie, the highly talented Survey General, the original height was computed at 269 feet. It rises on five stages with projecting galleries at each. The lowest three are of red stone, the 4th of red stone intermixed with marble. The first story (height 90 ft) is formed of 27 divisions or compartments alternately semi-circular and angular. The 2nd (ht. 90 ft) of semi-circular only and the 3rd (ht. 40 ft) of angular ones. Three hundred and seventy nine is believed to by the correct number of steps. On the night of the 10th September 1803, the eve of the Battle of Dehlie, the pillar was seriously injured by an earthquake and more especially at the base and 3rd story - the latter of which bulges considerably. 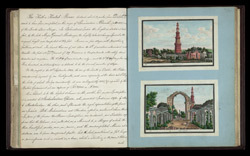 It was subsequently 1826/27 repaired by the British Government at an expense of Rs20,000 or £2000. Inscribed: naqsha-i minar-i Khvaja Qutb al-Din sahib. Mazhar ‘Ali Khan. Inscribed: naqsha-i minar-i ahani ? ?. Mazhar ‘Ali Khan.